GREENWICH VILLAGE — From gas pumps and beer steins to shopping bags and business casual. 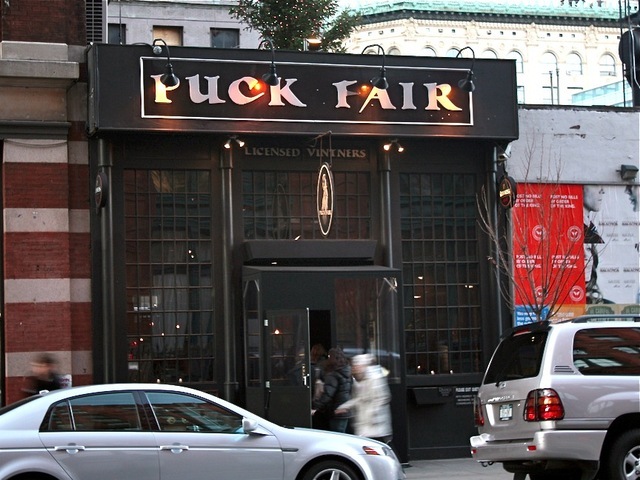 A SoHo property owner is planning to tear down the bar Puck Fair and the SoHo BP gas station, at Lafayette and Houston streets, to make way for a mixed-use office and retail building. LargaVista Companies —which owns the lots used by the gas station, bar and a former mechanics' garage now used for retail — revealed plans Monday evening for a seven-story, 91-foot-tall building on the southwest corner of Lafayette and East Houston streets. Architect Rick Cook of COOKFOX showed designs for a structure that intersperses gardens and glass, offering greenery on multiple balconies and the roof top. 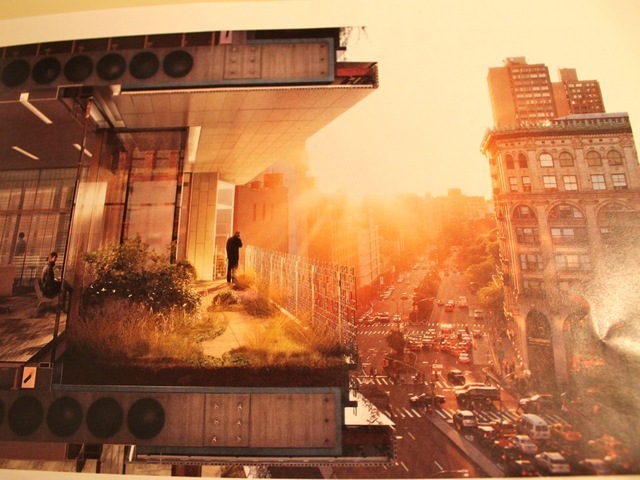 The result would be additional flora on busy East Houston Street. "These little moves of re-knitting the ecosystem do work," he said at a Community Board 2 landmarks committee meeting held in the Village. The building would be made of durable limestone on the first floor up until about eye level. The rest of the structure would be covered in white terra-cotta with a crackled finish, with silver metal details. Zoning attorney Elise Wagner, who is representing LargaVista, said the first two floors of the building are slated to be used as retail, plus the basement level. The space could house a single store as big as 30,000 square feet or could be broken up into several stores. 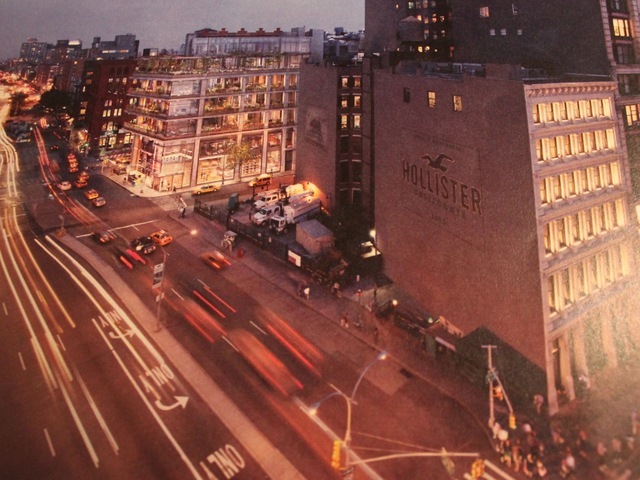 By way of comparison, the three-story Uniqlo shop on Broadway clocks in at 36,000 square feet. 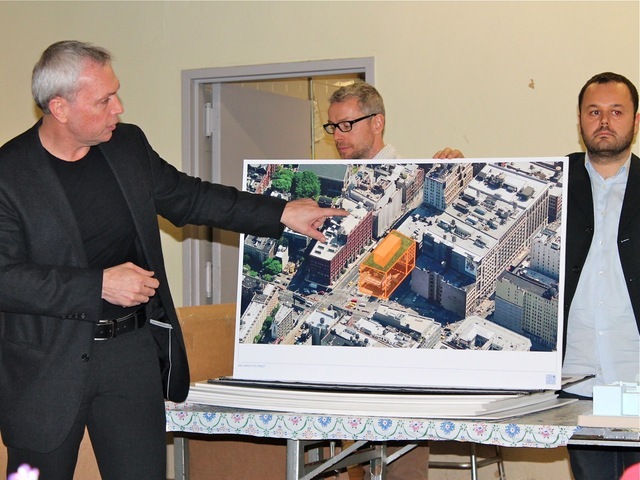 Though the development would demolish two buildings and a gas station that fall within the landmarked SoHo-Cast Iron Historic District, they have little individual value, said attorney Bill Higgins, who is also representing the developer. "They all have low levels of integrity and significance," he said. 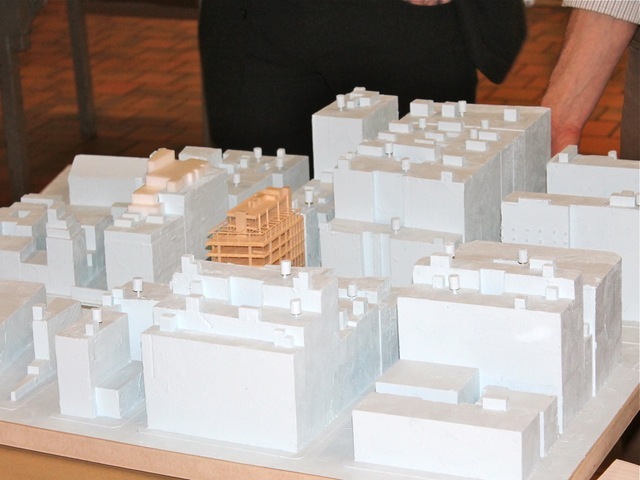 The LPC is scheduled to review the plan at a public hearing that starts at 9:30 a.m. Tuesday, April 9. CB2 will issue an advisory vote on the project at its full board meeting April 18. If the project obtains LPC approval, it will then go before the City Planning Commission for permission to create ground-floor retail, which is not allowed under the current zoning. LargaVista president Marcello Porcelli, who is a second-generation owner of the gas station lot, said developing the space was a longtime dream of his. "Ever since I was a little boy I've wanted to expand this site for a higher and better use," he said. Should be taller. This is a landmark spot, not some boring sidestreet needing infill to fix the street wall. Hell if I had my way I'd make it a plaza. Lord knows they need open space down there. 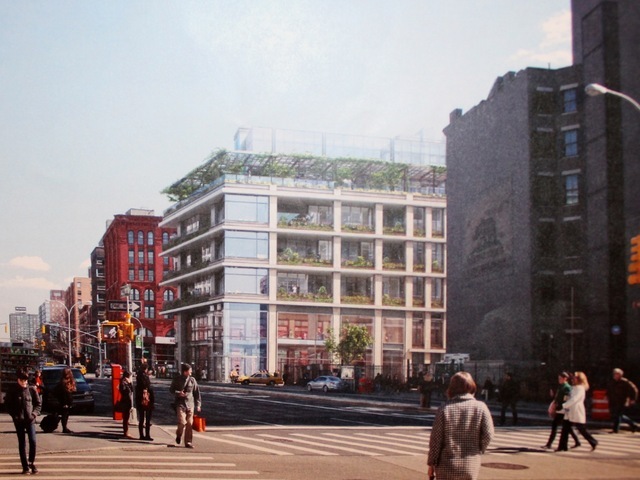 The building they are proposing is actually really nice (always a COOKFOX fan) but just not here. I agree that a plaza would be ideal, but since that's not happening, I am very pleased with this proposal. I hate that gas station. I hope that the shi.tty, city-owned lot with the sanitation trucks is developed too. P.S. : Is the rest of Houston getting a tree-filled median like W Houston? There aren't enough gas stations in Manhattan. There are only 3 left south of Fourteenth Street. This is the most centrally located one. Where are the hacks supposed to fill up their cabs? And they all need to fill up at around the same time (4:30-5) when the shift change occurs. Getting rid of this gas station will lead to even longer gas lines at the other two in downtown. That's ok with me. There's no reason to drive when we have good mass transit. The two blocks of raised median between Elizabeth & Mulberry just got planted in the last few days. Thanks, Lofter. Will the planted median be built across all of Houston? It would be nice if they widened the sidewalks too and added trees. There's no raised plantable median from Mulberry to Broadway, due to turning lanes. Just a narrow ribbon of slightly raised Belgian blocks. DOT should definitely widen the sidewalks for those two blocks, especially along the south side of Houston. When they rebuilt that a couple of years ago they pushed in large swaths of what look like bus pullover areas, but pedestrians are the ones that need the room. And with big retail going in on this site the density between Crosby and Lafayette will be insane. And to try to make some claim on the territory. This development includes some trees: 5 along Lafayette & 2 along Crosby (limited by street lamps & curb cuts -- even though about 1/2 dozen curb cuts that now exist into the BP site and at the neighboring ex-garage will be removed). 300 Lafayette will have exterior columns clad in terra cotta with ivory-toned crackle glaze (inspired by Louis Sullivan's Bayard-Condict Building, at Crosby & Bleecker, one block north across Houston). Detailing will be silver-toned & rust-colored metal. Terra cotta will also be used as ceiling material on the exterior terraces. The railings on those terraces are inspired by sidewalk vault lights as seen around SoHo, with round glass disks inserted here and there; the railings will be laser cut for precise detailing. The terraces vary in depth from 7' - 12' and the glass will have a slight frit added, in part to give visual warning to birds (who will be attracted by the terrace plantings). The openness of the terraces is especially apparent along the Houston Street facade, and great pains were taken to expose as much of the Puck Building as possible. One reason for the application for the Special Permit to allow the building to rise to 91' (rather than the zoning limitation of 85' before a setback) is to allow the new building to match up to floor heights at the Puck Building. Thanks for the info Lofter. This area is packed with stunning buildings. If we can get rid of the crap and enhance the streetscape, it would be ideal. I also will celebrate when the one story B of A with the huge sign on top of it is razed. That sign is horrible. Had many, many great nights in this place. Shame to see it go...progress I suppose. I did too, but if it means getting rid of the BP, I'm happy to see it go.